Order your own copy of Warrior Specialization and Signature Abilities Decks at your local retailer or online through our website today! For thousands of years, the Jedi defended the galaxy with their magnificent weapons and sage wisdom, but with the dissolution of their Order, the worlds they once protected have fallen to chaos and turmoil. One by one, worlds fall before the might of the Empire. In this new and corrupt galaxy, every living creature is faced with a choice—whether to defend what innocence remains or surrender to the call of darkness. Will you stand against the enemies of peace? 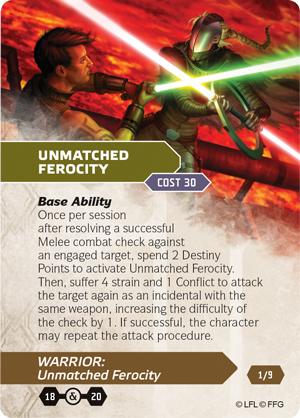 The Juyo Berserker Specialization Deck, Steel Hand Adept Specialization Deck, Colossus Specialization Deck, and Warrior Signature Abilities Deck for the Knights of Fate sourcebook of Star Wars™: Force and Destiny are available for order now at your local retailer or online through our website! 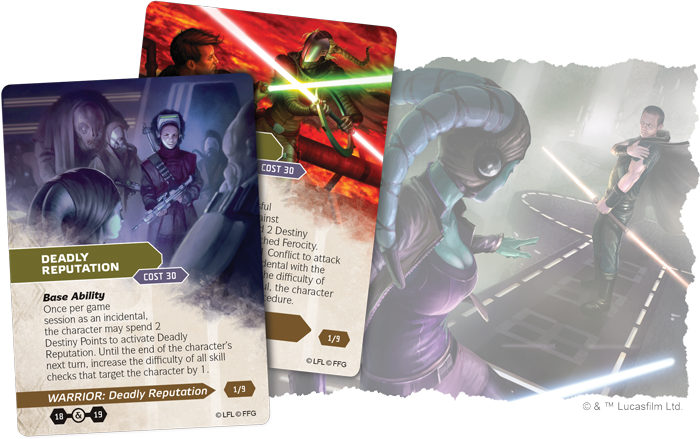 With the end of the Jedi Order, there is no single path which your Warrior must follow in your campaigns. Each of the three specializations explored in Knights of Fate feature a variety of talent sets to help you discover your destiny. You do not need to become a soldier or wield a lightsaber to embody all that a Warrior can become. 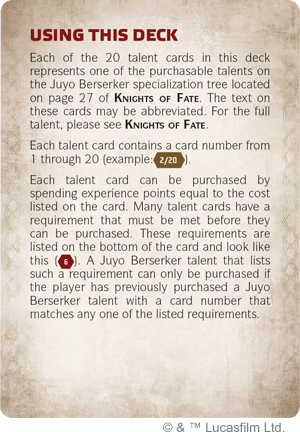 The beautifully illustrated cards in these specialization decks feature each of the purchasable talents on the three new specialization trees in Knights of Fate, providing a convenient, quick reference that you can display alongside your character sheet. With the focus kept on the action of your campaigns, nothing can stop you from discovering the true strength within yourself and finding your place in the galaxy. The ferocious Juyo Berserker is a master of the seventh and most aggressive form of lightsaber combat. Whether they are formally trained or self-taught, these fighters are able to harness their natural rage to walk the line between calm and fury, between the light side and the dark. This practice of focusing negative emotions into positive outcomes is difficult to master. Some choose to conceal raging emotions beneath layers of tranquility while others embrace the anger that drives them as they lay into their opponents. The Juyo Berserker’s focus on offensive maneuvers may leave them vulnerable to counterstrikes by their opponents, so they must match their foe’s skill and ferocity and leave them no room to become a nuisance. 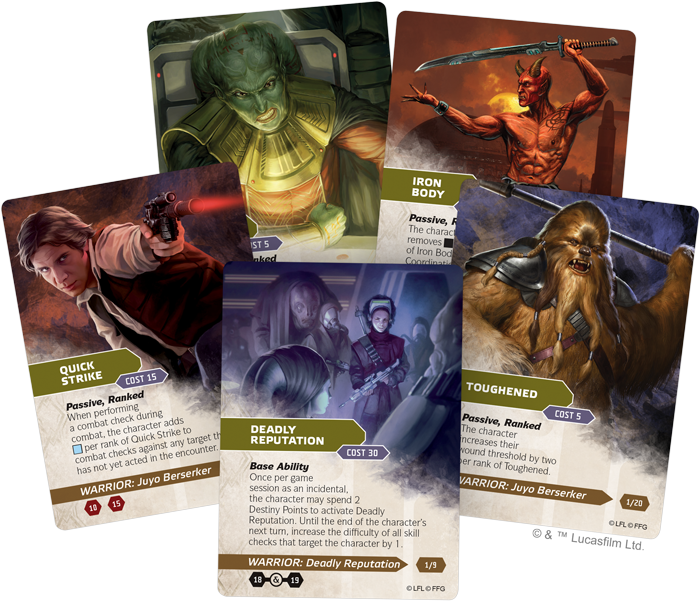 While the Jedi Warriors were identified by their use of lightsabers, the dangerous Steel Hand Adept fights without weapons, synching their mind and body to become the ultimate master of hand-to-hand combat. While no fist or claw can overcome a blaster’s range or heavy armor’s protection, these martial masters have the Force on their side, which they can use as a tool to breach heavy armor or strike at enemies far beyond the reach of their fist. Both fascinating and terrifying, these Force users can fight as effectively as their opponents, all without relying on a weapon. And should their enemy become disarmed, there is only one way an encounter can end. The indefatigable Colossus wears their scars with pride, possessing a power far beyond the ability to overcome pain. While other fighters may seek to end conflicts quickly, the Colossus possesses an unmatched stamina which they use to exhaust their foe. They reflect a number of the stoic Jedi traditions, prioritizing the mental and spiritual over the physical with the belief that pain only makes you stronger. This leads some to maintain a mental calm, while those who favor the dark side draw on the pain and their negative emotions to fuel themselves in battle. Members of this class use a variety of fighting styles, from favoring blasters and melee weapons to getting up close and personal with their opponent. Whether chasing higher aspirations or focusing on suffering, the Colossus is sure to return the pain they receive many times over. No matter which path you choose to pursue in your campaigns, any Warrior should use the Warrior Signature Abilities Deck as a source for breakdowns of the class’s key abilities: Deadly Reputation and Unmatched Ferocity. 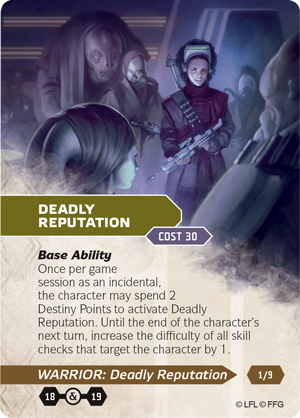 The Deadly Reputation signature ability allows a Warrior to spend two Destiny Points to strike fear into their foes, increasing the difficulty of all skill checks against them by one. Meanwhile, Unmatched Ferocity gives Warriors the chance to execute an additional attack on their enemies. While the Warrior must suffer four strain and one conflict themselves, this is a small price to pay—if the attack is successful, your Warrior may repeat the attack again! But no matter which path they choose, the Warriors must ask themselves: if they rain death upon their enemies, deriving joy from pain, what makes them different from the Empire? In a galaxy consumed by violence and hatred, there are few who would choose to take a stand. Do you have the courage and fortitude to believe in the light and keep the spark of hope alive? Order your copy of the Juyo Berserker Specialization Deck (uSWF47), Steel Hand Adept Specialization Deck (uSWF48), Colossus Specialization Deck (uSWF49), and Warrior Signature Abilities Deck (uSWF50) at your local retailer today or online through our website here!